The city of Davenport, Florida also known as Gateway to the Ridge! Davenport is a quiet, small town neighbor of Disney, placed just off the beaten path! Situated along US 17, and just east of US 27, Davenport has remained largely unchanged by the impact of world-size tourism just to the north. The rolling hills of the Lake Wales Ridge, stretching south for about 100 miles from this point in northeast Polk County, provide an idyllic setting for the town of Davenport! Only 2 square miles in size, and with a population of less than 2000, Davenport is nonetheless in the center of a booming residential area. The rapid expansion of Disney, coupled with thousands of vacant acres of land formerly used for citrus production, have drawn dozens of new subdivisions to the area! 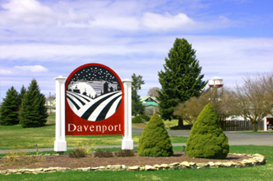 Davenport provides a variety of recreational opportunities to its citizens!